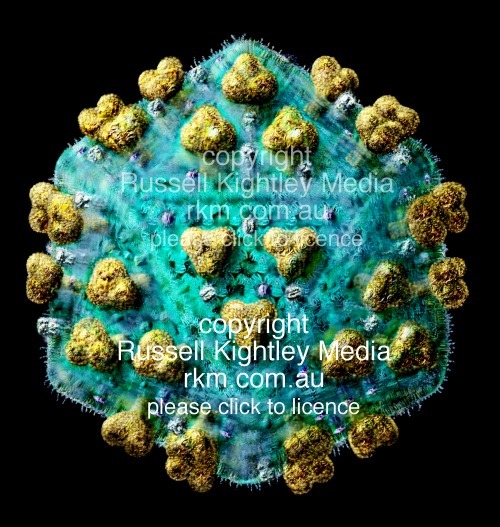 Illustration of HIV/AIDS virus particle (virion). The above image is 400 pixels across, the original measures 2200 pixels across. Human Immunodeficiency Virus (HIV or AIDS virus): this illustration shows the external appearance of the virion. The virus is coated (enveloped) in host cell membrane, which is drawn as a bluish green semi transparent layer in which various membrane proteins can be seen floating. Beneath the viral envelope lies the matrix. The matrix proteins are drawn as trimers that form an icosahedral molecular cage (please see separate matrix shell picture. The viral knobs (golden projections at the viral surface) insert into the matrix. These knobs allow the virus to attach to cells. The underlying matrix protein arrangement is based on the model for the MA shell published in: Journal of Molecular Biology (2000) 298, 841-857, Molecular Modelling Study of HIV p17gag (MA) Protein Shell Utilising Data from Electron Microscopy and X-ray Crystallography. M. J. Forster, B. Mulloy and M. V. Nermut. With many thanks to Dr Nermut for his help and advice: Milan V. Nermut MD, PhD, DSc(hon) National Institute for Biological Standards and Control (NIBSC website), Blanche Lane, South Mimms, Potters Bar, Herts EN6 3QG, U.K.